To best predict a new product’s end performance, engineers need to create prototypes with materials as similar to it as possible. This is a big reason why 3D printing with thermoplastics is gaining popularity. With a wide variety of options, such as ABS, polycarbonate, a variety of blends, plus engineered thermoplastics created specifically for different industries, it’s hard to turn the material away. Plus, thermoplastics may be the only choice for many applications. Picking the right material or combination of material is crucial to your application. To do this, you want to seek the best combination of the material traits while placing priorities where they belong. 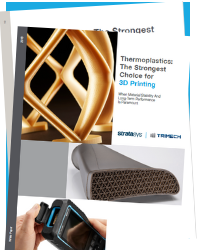 Download our white paper to review different thermoplastic material options to help you achieve your desired outcome.